This cupid is a part of a floor mosaic of Venus, in the House of Amphirite. The cupid is riding a dolphin and holding a mirror. Implied line is used to separate the negative and positive space. The space is very flat. Line is also seen as a natural part of the medium, for there is line in between the pieces of stone. This brings a sense of movement throughout the piece. The different pieces of stone being visual texture, as seen in the wings and the objects around the cupid, and shadows and highlights, as seen in the body and dolphin. The colour scheme is primarily blue with complimentary warm tones of stones. The texture of the physical tiles grab attention. The photo of the cupid seem dysfunctional, with floating seashells all on one plain. The tessera mosaic medium plays a huge role in the element and design. The small pieces of stone bring an effect of patience and importance to the artwork. The cupid has a feeling of worship, for the mirror is facing something other than himself. 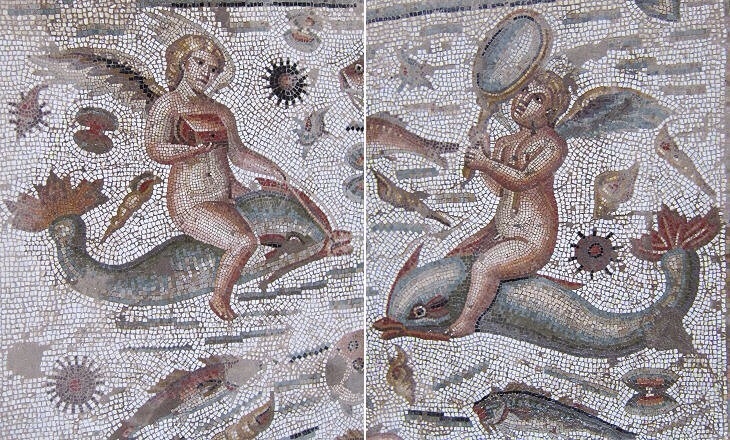 This artwork is a part of the mosaic of Venus, in the house of Amphitrite, which is connected to the Bardo Museum in Tunisia. It was rediscovered in 1949, in Tunisia, North Africa. Original made in the fourth century BCE in an ancient city named Bulla Regia. This cupid was a part of a floor mosaic in a triclinium. This traditional mosaic was made out of different coloured stones.